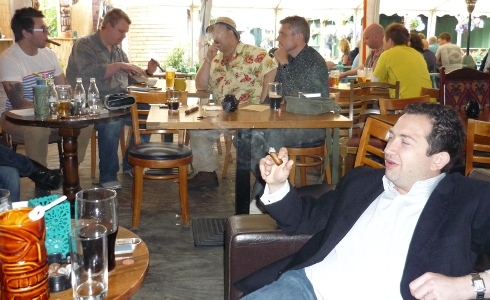 It was the work barbecue today so I thought I’d take the opportunity to smoke a couple of cigars. I started out with a Hoyo de Monterrey Petit Robusto (box code GEA OCT 08; in humi since 23 September 2009). The flavours are really starting to come through with these now but it still surprises me how strong they are still. I’d have expected them to calm down a bit by now but they are still quite a hefty smoke. Next up was a Bolivar Corona Junior (box code TEB JUL 07; in humi since 14 March 2011). I love my Bolivars and these are no exception! I’m a big fan of the Royal Corona but they can get rather brutal with the nicotine in the final third, so it’s good to be able to get the rich taste in a smaller package. The work events tend to end up in the pub so I find it beneficial not to have my head swimming from an overpowering cigar! One thing that always surprises me is the reaction a Cuban cigar receives in public. People either seem to think you are wildly pretentious, or are will strike up a conversation due to the fact that you don’t see them around so much now. 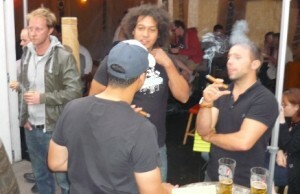 If you like cigars and aren’t a member of UKCigarForums, pop on over and join. Considering the majority of the London contingent were either on holiday or content to stay inside the M25, we did quite well on numbers! Smoked 31 July 2011. Box code LPM ABR 08; in humidor since 20 January 2010. This was far more like the Famosos that I’ve smoked and loved previously, but it was still quite tannic. Considering this was now over three years old and they are quite a mild cigar anyway, I’m surprised at how much aging these still seem to need. Maybe mine are a one-off? The hint of chocolate was present but very much in the background compared to some I’ve had. It was a bit of a ‘nothing’ cigar; perfectly smokable but not astoundingly good like my favourite Bolivars or Juan Lopez. Another cigar that I think I need to leave alone for some time!